Valentine’s Day is next week, and with it one of their busiest days of the year for America’s restaurant workers. For the servers and bartenders who rely on tips for the bulk of their income, the influx of couples celebrating romance with extravagant meals and expensive bills holds the promise of a nice payout. Unfortunately, for restaurant staff in most states, their windfall may not be as big as it seems. In fact, by the end of the week, their Valentine’s Day pay may turn out to have been nothing more than minimum wage. This is because in 42 states and the District of Columbia, there is a separate lower minimum wage for tipped workers, allowing restaurants (and other employers of tipped workers) to subtract a portion of their employee’s tips from the base wage paid by the house. In 18 of these states, restaurants can pay tipped workers as little as $2.13 per hour so long as—over the course of the week—the combination of tips plus the base wage averages out to at least the regular minimum wage. Setting aside the fact that in almost every state the regular minimum wage is far too low, consider the challenges this separate lower minimum wage creates for tipped workers. The bulk of their paycheck is up to the whims of the customer, and research has shown that quality of service often has little to do with what the customer chooses to tip. Weekly, let alone monthly, income is harder to anticipate, making planning and budgeting more difficult. (Imagine trying to evaluate a mortgage offer or a car loan payment schedule if you have little ability to forecast your monthly income.) Racial bias has been shown to affect tipping, and worker advocacy groups argue that the pressure to ensure customer satisfaction, particularly in a workplace where customers are consuming alcohol, forces restaurant workers to suffer high rates of sexual harassment. Furthermore, although the law requires that employers make up the difference so that tipped workers receive at least the minimum wage, this does not always happen in practice. Importantly, this is not how tipped workers are paid in every state. As of 2017, there are 8 states where tipped workers are treated the same as all other workers, receiving the regular minimum wage regardless of tips: Alaska, California, Hawaii, Minnesota, Montanan, Nevada, Oregon, and Washington. Last November, voters in Maine and Flagstaff, AZ also elected to gradually raise their minimum wage for tipped workers until it is equal to the regular minimum wage. Tipped workers take home significantly less per hour of work in states where employers can pay a base wage less than the regular minimum wage—even after factoring in tips. The table below shows that tipped workers make 15 percent less in hourly pay (inclusive of tips) in the states where they receive a $2.13 base wage than in “equal treatment” states where tipped workers are guaranteed the regular minimum wage as a base, regardless of tips. 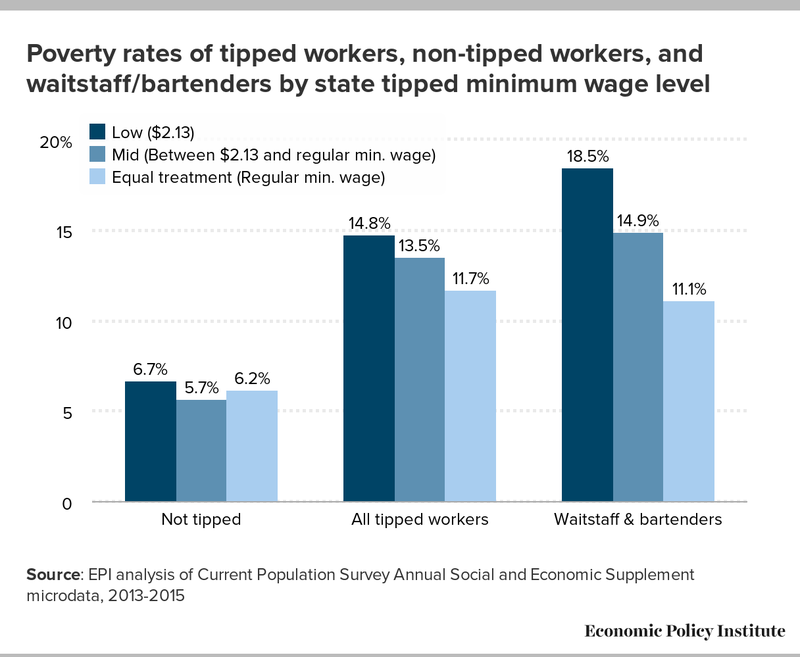 Waitstaff and bartenders (who are a subset of tipped workers) in $2.13 states make nearly 17 percent less than their counterparts in equal treatment states. 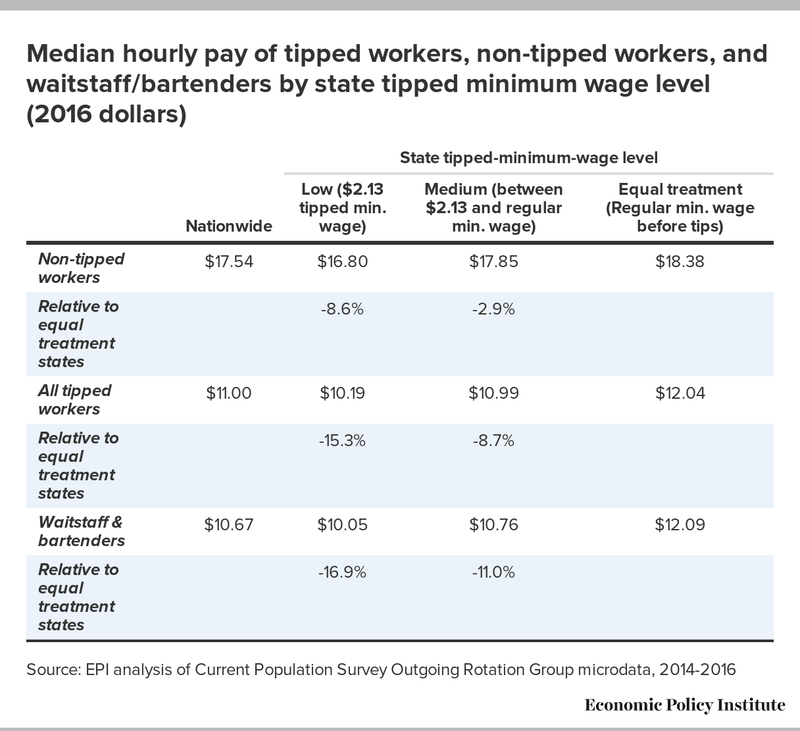 Non-tipped workers earn 8.6 percent less in $2.13 states compared to non-tipped workers in equal treatment states, so these differences are not simply a function of differences in overall pay levels. Tipped workers experience dramatically higher poverty rates in states where they can be paid a separate, lower minimum wage. As the figure below illustrates, nearly 15 percent of all tipped workers in states with a $2.13 tipped minimum wage are in poverty, compared with only 11.7 percent of tipped workers in states where they are guaranteed the regular minimum wage regardless of tips. Among waitstaff and bartenders, the differences are even more dramatic—nearly one in five waiters, waitresses, and bartenders are in poverty in states where restaurants can pay them a base wage of $2.13 per hour. In states where this is prohibited, only one in nine servers and bartenders are poor. Note also that the poverty rates of non-tipped workers are very similar across these state groups, making it hard to imagine that these differences in poverty rates for tipped workers are caused by anything other than the differences in state tipped minimum wage policy. Imagine if other professions operated this same way. If every time a car salesperson made a sale, the dealership subtracted that commission from the salesperson’s salary, I suspect there would be considerable outrage and it would be a lot harder to hire and retain car salespeople. Yet we allow tipped workers—particularly in restaurants—to suffer this indignity all the time. I can only surmise that this is because tipped workers tend to be younger than the overall workforce—although the majority are at least 25 years old—and the majority of them are women. Restaurant industry advocates claim that tipped workers like the current system and that to change it would ultimately lead to lower pay or fewer restaurant jobs. The data do not back up this claim. In the eight states that already guarantee tipped workers the regular minimum wage regardless of tips, not only do tipped workers have higher take-home pay, but employment growth in the restaurant industry has been at pace, if not faster, than in states with lower tipped minimum wages. There is no reason why restaurants in Minnesota or Montana (among others) can pay their servers the regular minimum wage regardless of tips, yet New Jersey and Virginia (among others) cannot. It is simply a policy choice.